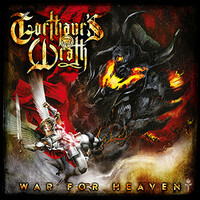 RockUnitedReviews: GORTHAUR'S WRATH: "War For Heaven"
Soft and fluffy as a new born baby bunny - the opening instrumental piece (The Great Creation) really set the pace and standard of the entire album. NOT! Nothing could be further from the truth and you've probably already guessed this by reading out loud the monicker of the band. Seriously, they're from Balkan (Croatia actually), Gorthaur's Wrath is the name, semi-melodic Black Metal is the game. Thankfully not as blunt and frankly put unlistenable as The Norwegian church buring acts of the early nineties. These chaps do have some kind of sense of melody and harmony. They're still pretty sinister though and it's the full on rampant riffing, slicing through hordes of goblins and various other creatures of the night. Merely check out the track, "Born Of Sin", for a deadly dose of Ministry metal. It's not all strickly black. The instant success a corpse painting can award a band - not to be messed around with though as the image will certainly attract the diabolic few. The album speak of blood and disorder and the result is promising even if I personally can't stand the overkill and over-use/abuse of four letter words instead of proper ones. It's simply just a sign of poor linguistics (well aware of the irony - no need for the abusive language).